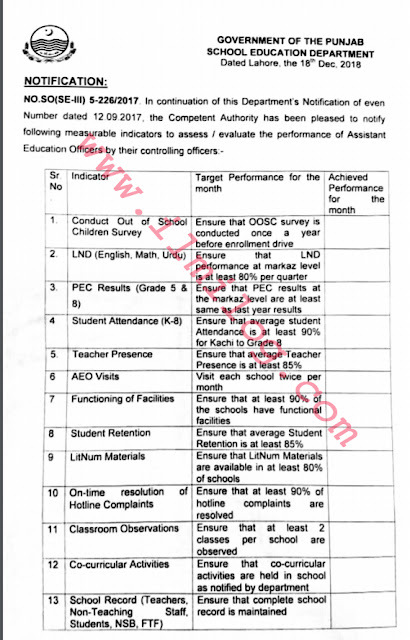 NOTIFICATION: NO.SO (SE-111) 5-226/2017 dated Lahore the 18th Dec 2018 regarding How to Make Assistant Education Officer Performance Check by a government of the Punjab school education department. 1. 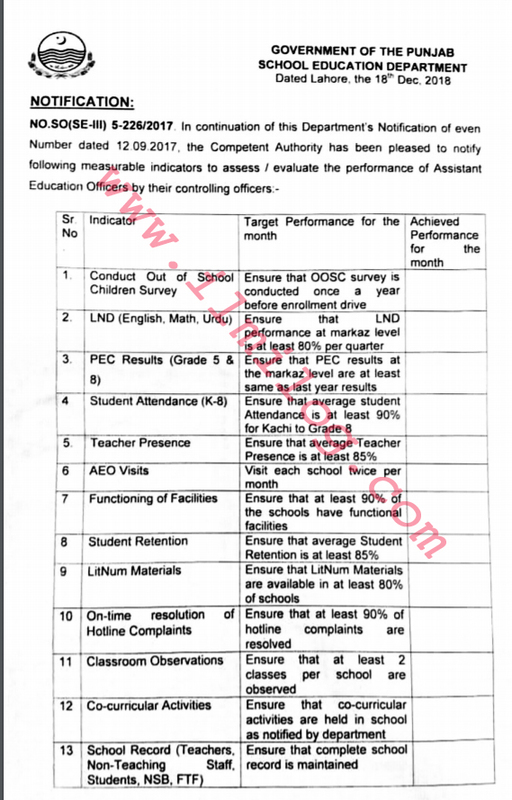 Conduct out of school children survey: Ensure that OOSC survey is Children Survey conducted once a year before enrollment drive. 2. LND (English. Math. Urdu): Ensure that LND performance at Markaz level is at least 80% per quarter. 3. PEC Results (Grade 5 & 8): Ensure that PEC results at the Markaz level are at least the same as last year results. 4. Student Attendance (K-8): Ensure that average student Attendance is at least 90% for Kachi to Grade 8. 5. Teacher Presence: Ensure that the average Teacher Presence is at least 85%. 6. AEO Visits: Visit each school twice per month. 7. Functioning of Facilities: Ensure that at least 90% of the schools have functional facilities. 8. Student Retention: Ensure that average Student Retention is at least 85%. 9. LitNum Materials: Ensure that LitNum Materials are available in at least 80% of schools. 10. On-line resolution of Hotline Complaints: Ensure that at least 90% of hotline complaints are resolved. 11. Classroom Observations: Ensure that at least 2 classes per school are observed. 12. Co-curricular Activities: Ensure that co-curricular activities are held in school as notified by the department. 13. School Record (Teachers. Non-Teaching Staff. , Students, NSB, and FTF): Ensure that complete school record is maintained. 14. School-Based Action Plan (SBAP): Ensure that SBAP is Prepared. 15. School Council: Ensure at least one School Council meeting per month. 16. Attend Monthly Meetings: Attend monthly meetings (Pre-DRC, DEO, Dy. DEO, and Head Teacher). 17. Teacher Pieces of training: Ensure that all teachers attend training as communicated by the department. 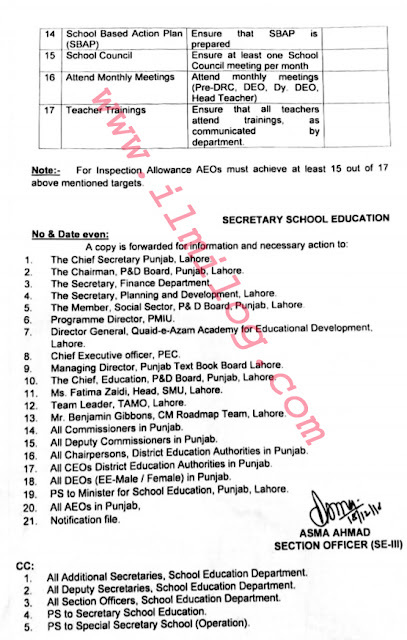 All Additional Secretaries, School Education Department. All Deputy Secretaries. School Education Department. 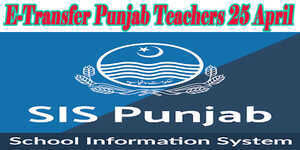 All Section Officers, School Education Department PS to Secretary School Education PS to Special Secretary School (Operation).